Crytek's switchover to free-to-play games might have its upsides. News that Crytek will be giving up the AAA race and entering the free-to-play market following the release of Crysis 3 no doubt came as a bitter disappointment to the German developer's fans. There is a silver lining, however. See, back in 2009, Crytek purchased a developer called Free Radical Design and promptly renamed it Crytek UK. Free Radical was responsible for a little game you might have heard of called TimeSplitters (it also developed Haze, but let's ignore that one for now). 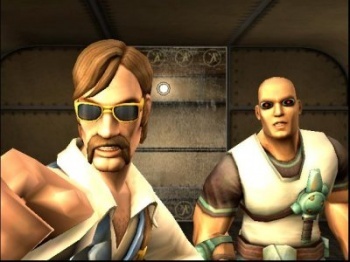 The market hasn't been kind to TimeSplitters, and the gaming public hasn't seen a new installment of the series since 2005's TimeSplitters: Future perfect. Some have pointed out that TimeSplitter's madcap multiplayer would be perfect for Crytek's recently launched free-to-play gaming service, G-Face - a fact that hasn't gone unnoticed by CEO, Cevat yeril. "Look, I wish we were working on it. I will say that," he said. "I think hopes are high, but change has to happen in the platform space. I'm very excited potentially about the idea of a TimeSplitters for G-Face." "The thing with TimeSplitters is, if we made a sequel to TimeSplitters, nobody would accept this apart from some fans, and we don't know how big the fan community is unfortunately," he continued. "And we don't want to design this as a packaged goods game that launches on a console, and even if we wanted to I don't think publishers would like the idea. That is the truth, and that was the truth even before we bought Free Radical." Yerli made it abundantly clear that there's no TimeSplitters project in the works, but his comments do offer a tiny glimmer of hope in a dark, unforgiving, TimeSplitter-less universe. Essentially, the status of TimeSplitters 4 has been updated from "never happening" to "probably never happening." I'll take what I can get at this point.